Backstage and Beyond: Closing Party at Magnetic FieldFebruary 2, 6-8 PMHAPPY HOUR!! 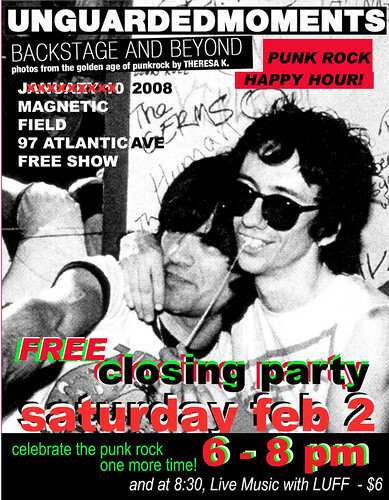 We have had a FANTASTIC TIME hanging up in Magnetic Field and we're gonna go out IN STYLE with a punk rock happy hour closing party celebration... one more time to take a gander at the big blow ups of Darby Crash, The Cramps, Belinda Carlisle and many other punk rockers captured in their Unguarded Moments. come to Magnetic Field to buy this special print!! If you didn't know this... February 2 is the 126th anniversary of the birth of my favorite writer in the English language, James Joyce. For those out there reading this who do know me, you know that I traditionally throw a party on February 2 - because in addition to it being Joyce's birthday, it is also the anniversary of the publication of his masterpiece, Ulysses by Sylvia Beach in Paris in 1922... making 2008 the 86th anniversary of the book's birth. What does this have to do with punk rock and my photo show? Well --- the music playlist will be Hiberno-heavy... featuring Irish artists and those of Irish descent, oh... like the Pogues, Elvis Costello, Undertones, Boomtown Rats and others... don't worry... I don't think we'll be spinning any U2 but I will be sneaking in some Thin Lizzy, because Phil Lynott was a big fan of the punk rock. Since it is happy hour anyway... its time to enjoy the best of Irish libation -- Jamesons (which they drink in Ulysses), Guinness and I will be bringing some munchies for our final photo show fling. Anyway -- see you at Magnetic Field on Saturday, February 2 from 6 - 8 PM... punk rock happy hour, some munchies and lots of sound and vision!! !